For Parched/Depleted Skin. 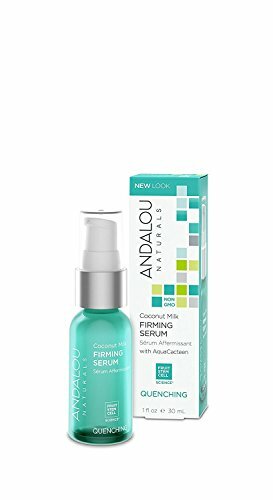 This nourishing facial serum, with coconut milk amino and essential fatty acids, instantly hydrates, fortifies, softens, and conditions improving the appearance of skin tone and texture for a healthy, smooth complexion. AquaCacteen, derived from prickly pear cactus, nourishes and soothes as water- binding nutrients provide lasting hydration for a lifted, firmer appearance and renewed vitality. ECOCERT certified. HYDRATING SERUM: This nourishing facial anti-aging serum, with coconut milk amino & essential fatty acids, instantly hydrates, fortifies, softens, & conditions improving the appearance of skin tone & texture for a healthy, smooth looking complexion. FOR DRY, DEPLETED SKIN Our Quenching Coconut Water line of skin care products include firming cleanser, toner, eye cream, day cream, night cream, and firming mask, all carefully crafted work in tandem to deeply nourish your skin. Hydration starts here. Andalou Naturals embodies beauty in action. We infuse the best of nature and knowledge into mindful and effective products that are good for people and the planet. Our skin care, hair care and body care products are made thoughtfully and beautifully, blending advanced Fruit Stem Cell Science with natural and fair-trade ingredients, with a minimum 70% certified organic content, for visible and healthy results. The meaning of Andalou is ‘Path of Light’, and we believe it best reflects our intention to foster good things in the world and enrich the lives we touch, one responsible product at a time. Andalou Naturals Body Care with Fruit Stem Cell Science renews skin at the cellular level, blending nature and knowledge for healthy radiance and vitality. Cooling aloe vera and mint leaf, cocoa butter, and gentle cleansing botanicals to freshen, vitalize, and moisturize for soft, healthy skin. We champion Certified Organic, Natural Origin, BioActive, Fair-Trade, Verified Gluten-Free, Non-GMO Project Verified, Vegetarian and Vegan Ingredients, Eco-Friendly Practices, and a Meaningful No Animal Testing Policy. We reject GMO’s, Petrochemicals, Phthalates, Sulfates, Synthetic Colors, Dyes, Fragrances, Triclosan, PEG, MEA, TEA, DEA, or Paraben Preservatives. Ingredients :Aloe Barbadensis Juice*, Sodium Decylglucosides Hydroxypropylsulfonate, Sodium Methyl Cocoyl Taurate, Vegetable Glycerin, Fruit Stem Cells (Malus Domestsica, Solar Vitis) and BioActive 8 Berry Complex*, Mentha Piperita (Peppermint) and Vanilla Planifolia Extracts*,Panthenol (Pro-Vitamin B5), Oenothera Biennis (Evening Primrose) Oil*, Aspalathus Linearis (Rooibos) Extract*†, Prunus Armeniaca (Apricot) Oil, Cyamopsis Tetragonolobus (Guar) Gum*, Theobroma Cacao (Cocoa) Butter*, Allantoin, Sodium Benzoate, Citric Acid, Potassium Sorbate, Ethylhexylglycerin, Mentha Piperita (Peppermint) Oil*.